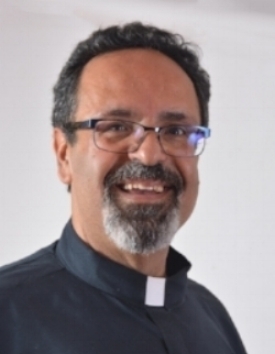 The Reverend Gerardo Romo has a Bachelors Degree in Classics and Humanities from the "Seminario Diocesano de Guadalajara, Mexico." He did a masters on Philosophy at Seminario de Guadalajara, and a masters on Theology at Universidad a Intercontinental, a Diploma on Anglicanism, at Seminario Anglicano de San Andrés. He was ordained deacon on May 28, 2004, and priest on January 8th, 2005. He worked as Chaplain at “Julian of Norwich Community Center," an outreach program of Christ Church, Mexico City and also was a hospital chaplain for the English Hospital (ABC Hospital); at an institution for terminally ill people living in homelessness as well as in public hospital of the health system in Mexico City. He ministered as a vicar of a mission congregation on the outskirts of Mexico City. He studied Franciscan Spirituality in England, at the Franciscan International Study Center in Canterbury, Kent, U.K., during the 4 years he belonged to the Society of Saint Francis, a Franciscan Anglican Order. During his time in England, he worked on programs to help persons living in homelessness, with programs of advocacy, training, feeding and hygiene (showers and laundry), also providing an address for them to be able to apply for a job, and eventually getting out of the streets. He served as Vicar of St. Hilary's Episcopal Church, an Anglo congregation, at Hesperia, California, where he started a brown bag lunch program and advocacy for the Day Laborers; He also served on the Diocese of Los Angeles Commission on Ministry, and as Coordinator of Hispanic Ministry. He actually is the Bishop’s Vicar for Hispanic Ministry gor the East End of the Episcopal Diocese of Long Island.